Kilkenny selector Mick Dempsey and senior hurlers Richie Leahy and Jason Cleere were in the hot seat when 100 students from St Kieran’s College paid a visit to Institute of Technology Carlow. Ireland’s second-largest institute of technology invited the Transition Year students to visit the campus where they toured the facilities, attended a careers talk, took part in a fun sports skills event and yoga. 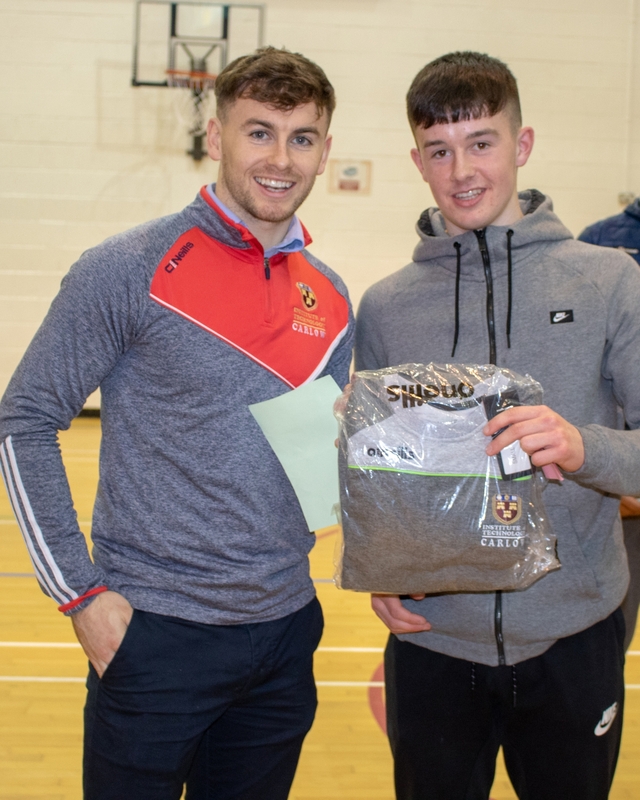 Richie Leahy, who is studying for a degree in Sports Management and Coaching (GAA), and Jason Cleere, who is an Accounting student, talked to the students about career opportunities and their own experience of IT Carlow. This was followed by a lively question and answer session led by Mick Dempsey, who is the GAA programme director at IT Carlow. The day ended with a prize-giving ceremony that saw presentations made to students Eoin Crowley (first), Josh Dempsey (second) and Jack Clifford (third) by Waterford hurler Colin Dunford, who works with the IT’s Schools Liaison Office.